Scolari out, Murtosa out. Galeano, technical coordinator and Felipão’s protégé, out. Narciso (at least temporarily) commanding the squad, including Marcos Assunção, back from a minor knee surgery. Enough to surprise, revert, bring havoc to the arch enemy in Sunday’s win or win derby? Not quite. It was a reprise. Itchy referees, stupid Palmeiras players (read Luan) not able to control their temper, nerves and more nerves, lack of attention leading to crucial mistakes, lack of skills (damn it how hard can it be to head the ball LOW) and the regular dose of bad luck. 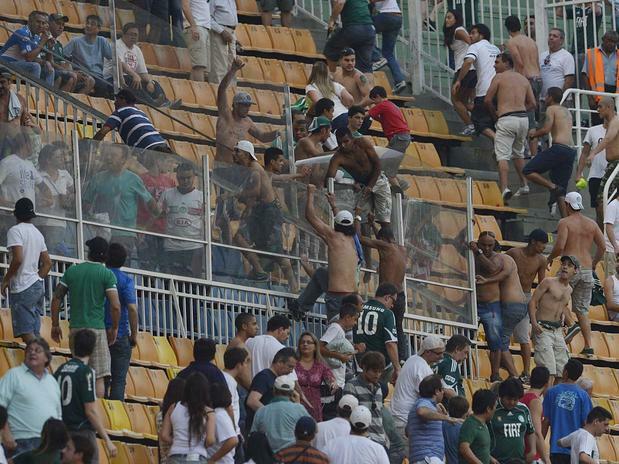 In the end, what we had was not such a small number of the 25.000 present Palmeiras supporters invading the VIP section at the Pacaembu, looking to give club president Tirone and vice-president Frizzo a good beating. President Tirone was supposed to open a football event today at the New Arena, entitled “The Future of Brazilian Clubs”. He didn’t show up, afraid of facing protests or something worse. I’d imagine finding Palmeiras a new coach has turned into second priority for Mr Tirone: he needs to find his spine before he crumbles to the floor. If you’re looking for courage and spine, better look elsewhere. I suggest enjoying two minutes of the smallest largest palmeirenses of them all – Renan Barreiros – as he pays back his promise for Palmeiras winning the Brazil Cup anno 2012. Larger than life, our dear Renan. Larger than life. Figueirense are the next opponent. Saturday. A more than direct contender. Defeat is unthinkable if we want to have any hope whatsoever of remaining alive. What else to say… paraphrasing IBM… “stop talking. start doing!”… make this should be the new black at Palmeiras! Hehe. So, what do you think of the choice of Kleina, Sheila?